There were tons of assorted Gears "souvenirs" sold at folding tables set up in the arena's concourse. Over the years I've made an effort to collect some of these as "artifacts" of the team. The one seen here is one of my favorites, because it is so "70s." Yes- Saginaw Gears coasters! Note two things- first, the dazzling, dropped acid in the previous decade, Brady Bunch looking box. Note second- you get exactly TWO of them in a box! Wow, good for you and exactly one friend to rest your glass in while you listen to Wally Shaver and Al Blade calling a game on WSAM. I'm not 100% sure that this item was actually sold at Gears games because I do not recall ever seeing them being sold. Yet the age and appearance of the box and cheap-O quality of the item, both scream "Gears Souvenirs!" If any of you reading this can confirm these actual Gears souvenirs- please post a message here. 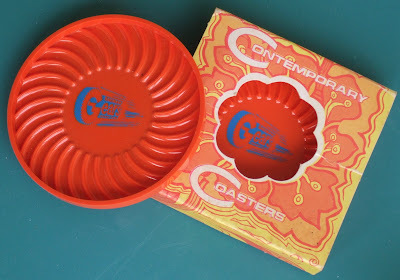 So yeah, I had one of those coasters from the early 70s. We only had one, so if they came in boxes of two her sister must have taken the other one. My mom would have taken me in maybe '74-'75? The presence of it in every house I lived in through high school is so vivid. Man I miss those days of IHL hockey!